McDonald’s Qatar announced today that more than 28,000 free Egg McMuffins will be redeemed by customers across Qatar on March 9th, 2015 during National Breakfast Day. Dubbed the World’s Biggest Breakfast, National Breakfast Day will witness more than 400crew members in 28 McDonald’s restaurants across the country, who will serve thousands of customers in just four hours. 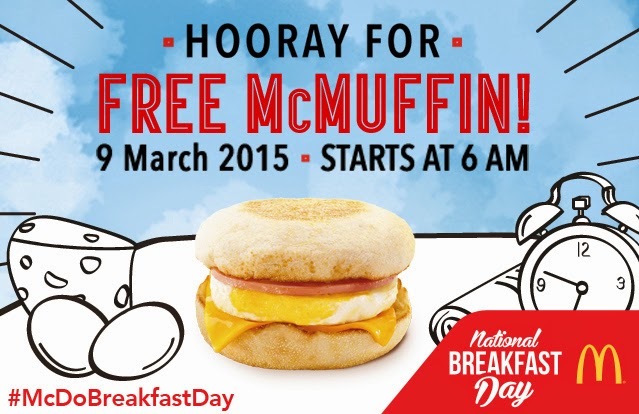 National Breakfast Day marks the third time McDonald’s has initiated an international celebration of this scale. In 2014 and in the GCC alone, 230,000 Egg McMuffins were redeemed. Dozens of other markets across Asia, the Middle East and Africa also participated in what is considered the brand’s most successful international breakfast event. Egg McMuffins are an iconic handheld breakfast consisting of a fresh Grade A egg, chicken roll and a slice of melted cheese, held together by a freshly toasted English muffin. First introduced in the US in 1971, the McMuffin range is now the brand’s signature breakfast offering, with more than 1.2 billion sold per annum woldwide. Al Suhain Bin Hamad St.
You're back? How was the vacation? I hope you enjoyed yourself. Oh, I miss their longanisa too.